In response to our story about PBS producer Rick Sebak filming at the Shoe House, good friend Jess asked what were the top 5 Lincoln Highway sites in PA mentioned by LHA director Mindy Crawford? Glad you asked! Yep, six! Mindy said couldn’t bear to leave out any of them. If I had to cut one, it would be Grandview Point, even though I’m writing a book about it and the Ship Hotel there (due out Spring 2010). 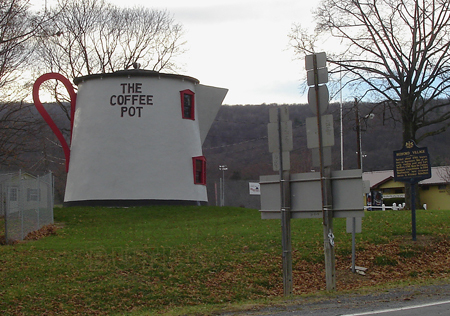 But if I could replace it, I’d go for Mister Ed’s Elephant Museum between Chambersburg and Gettysburg — Rick is not as enthusiastic about it, but for me it’s a rare throwback to old-time museum and candy shops. And I’d plead to group two in Bedford and add the Coffee Pot to Dunkle’s since it’s just down West Pitt Street. OK Jess, you have two weeks — can you see them all? Maybe we’d better just make a lunch run to Peppi’s! How about the top 5 must-see LH sites in the US? Dunkle’s must be one, and maybe the nearby Lincoln Motor Court too. It’s tough but I can pick three more (two of them also very close to each other in the Midwest). Send your top 5 and we’ll gather them into a post next week. 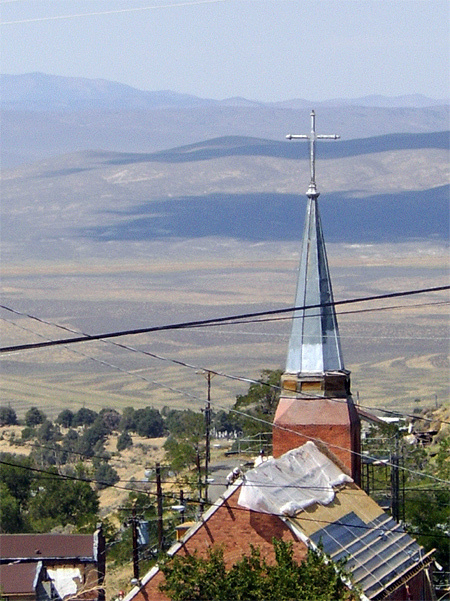 Jan Morrison sent a story from Preservation magazine about the church she and others in tiny Austin, Nevada, have been restoring. Work so far has taken four years and $353,000 in state grants. The town of 300 was once a booming mining town but is now one of the few outposts in the state along the Lincoln Highway (aka US 50 or “the loneliest road in America”). It increasingly looks to tourism for economic revival. “The goal,” resident Jan Morrison says of restoring St. Augustine’s church, in Austin, Nev., “is not to make it look brand new, but to look like it’s 140 years old.” To be exact, the long-vacant church, which is listed in the National Register of Historic Places, turns 142 this year. It sports a new steel roof and granite support wall that fend off further decay without altering its original Gothic Revival and Italianate design. But while form remains, function will change. When Morrison bought the building in 2004 from the Reno Diocese for $26,000, she formed the nonprofit St. Augustine’s Cultural Center, envisioning a venue for hosting conferences, art performances, weddings, family reunions and other events…. Gary Kinst sent these photos of Auburn Boulevard in Sylvan Corners, California, showing a new Lincoln Highway commemorative sign. 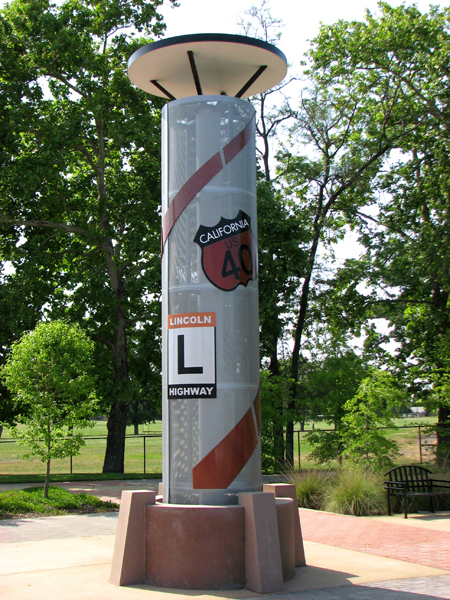 When the corner was redeveloped, a US 40 sign was incorporated into the architecture but nothing to reflect the LH, so efforts were taken to rectify that and a new LH sign is prominently displayed. LH cartoon shows Pittsburgh-WV rerouting: why? Fellow author and blogger Jason Togyer writes that while digging up material about his forthcoming book on the G.C. Murphy Company, he spotted this cartoon in the Friday, Oct. 17, 1930, Pittsburgh Sun-Telegraph. The reference here is to the rerouting of the Lincoln Highway through West Virginia, changing the route west of Pittsburgh, PA. The original routing along the Ohio River to East Liverpool, Ohio, had long been congested and waiting to be bypassed. But that’s the odd thing — the LH came through Pittsburgh in 1913. The LHA board of directors officially changed the route in December 1927 to what was named US 30 through Crafton, Clinton, and Imperial, into through Chester, WV, and across the Ohio River to East Liverpool). 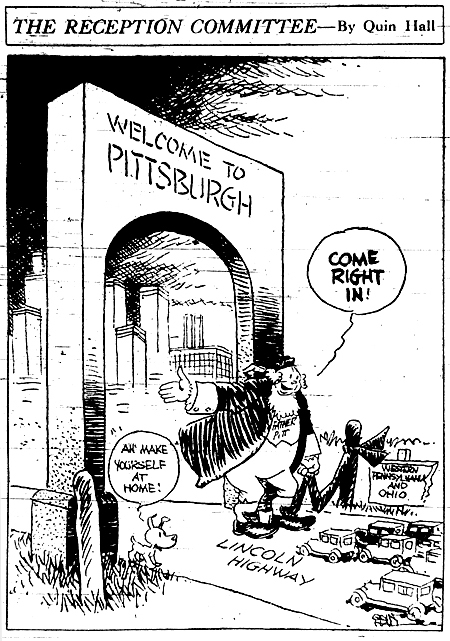 So why was a cartoonist welcoming the road to the city in 1930? Jeff Mahl got a standing ovation at the Geneva History Center on August 23. He described how he listened to his great-grandpa’s stories. When he was 14 and had to write a history assignment in school, that is when he realized how famous and important his great-grandpa was. Then he really paid attention to all of the stories, and thought they were better than anything on TV at the time. George Schuster lived until he was 99, he still shoveled snow at age 98, and still had a drivers’ license when he was 95. Then, Mr. Mahl began his talk by putting on a driving jacket and sitting in a chair, and told the story in first person, like he was Schuster himself, with a PowerPoint. Schuster found out the day before the race that his boss wanted him to be in it and had very little preparation. E.R. Thomas chose him because he was a mechanic. The Wyoming Tribune-Eagle reports that a huge stretch of land west of Cheyenne that includes traces of the Lincoln Highway is being considered for a multitude of projects, from a wind farm to a landfill to a golf course. The Belvoir Ranch has long included the paths of westward travel, from overland immigrants to fiber optic cable. Then in 2003, the City of Cheyenne bought the land which begins five miles west of town and stretches for 15 miles farther west, with I-80 as its northern boundary. While some residents see the 18,000-acre purchase as a boondoggle, others see it as acquiring water rights and sites for a landfill, wind turbine farm and recreation. It is also a chance to preserve a microcosm of western cultural history. Chuck Lanham of the Cheyenne Historic Preservation Board, the guide for a recent ranch tour, pointed out teepee rings at least 140 years old and other archeological features that have yet to be studied…. Ruts across the rolling, shortgrass prairie show the route of the Denver to Ft. Laramie stage line. Other ruts are thought to be Camp Carlin supply wagon tracks to frontier forts. 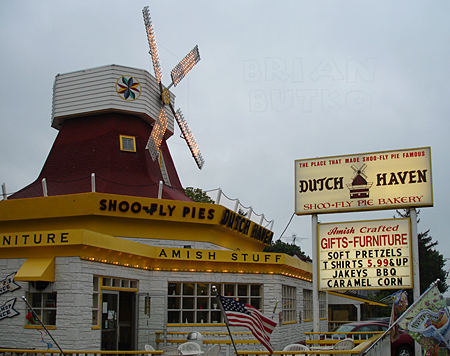 There are vestiges, too, of the old Lincoln Highway, precursor to U.S. Highway 30 and Interstate 80…. Eventually, the early homesteads became part of the huge Warren Livestock Company holdings. F.E. Warren called the main ranch house his “cabin,” complete with tennis courts, pool and a professional horse racing track. Remains are barely visible today. Because of the 1962 Cuban Missile Crisis, Atlas missiles were installed on what soon became known as the Belvoir Ranch. The above-ground launching facilities were deactivated in 1965, but the concrete structures can be seen south of I-80 at exit 348. To learn more about the plans, including maps of the proposed developments or photos of the site (as reproduced here), visit http://www.BelvoirRanch.org or call (307) 637-6281. The Eastern Terminus of the Lincoln Highway has never been marked – it was always simply Times Square – but Jerry Peppers is determined to change that. Here he is taping a temporary paper sign to his favorite concrete post at Broadway and 42nd Street during filming for Rick Sebak’s upcoming special. Rick also sent an updated photo that shows him at the intersection, which you’ll find at the end of this post. The Western Terminus in San Francisco has been marked in various ways over the decades. Today it has a reproduction of a 1928 concrete post – click here to see read about Denny Gibson’s visit a couple weeks ago. LHA member Bill Spoon called to say the Lincoln Highway is being widened between Gettysburg and New Oxford, Pennsylvania. 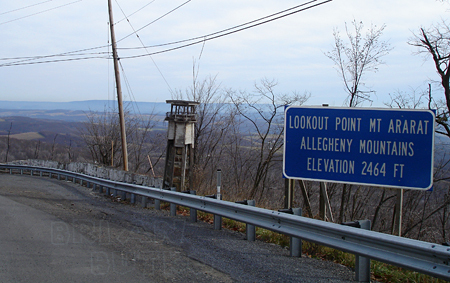 He worried about a couple markers by the roadside – one a LHA 1928 concrete post, and one a c. 1820 turnpike marker incised with mileages to Gettysburg, York, and Philadelphia. DESCRIPTION – This work is the removing and resetting of existing historic concrete markers. CONSTRUCTION – Survey and record the existing marker location. Remove marker prior to the start of construction and store in a secure location. Reset marker near the original location as directed after adjacent construction is complete. Care should be taken to avoid damage to the existing markers during removal, storage, and resetting. It’s good to see highway departments becoming aware of historic resources related to roads themselves. For more information, contact festival organizers at festival@rochelle.net or (815) 561-7044 or visit www.lincolnhighwayheritagefestival.com/.